Screw Terminals with 3.5mm pitch pins. Comes in 2 or 3 positions and have the really cool feature of slide-locking together to form any size you need (4, 5, up to 20 without problems). Rated up to 125V @ 6A. 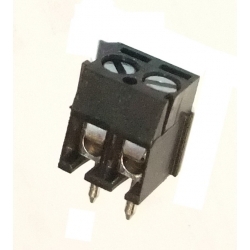 Terminal can accept 30 to 20AWG wire. 3.5mm/138mil pin pitch will not fit standard 0.1" perf boards but this is the most common pitch screw terminal.